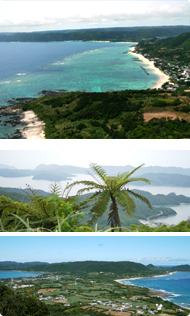 The imposing subtropical island of Amami is ringed by many natural plants with its scenery greatly enhanced by the surrounding seas. This beautiful scenery is further contrasted by the large expanse of blending seas and land on the west side of the island. The island gives a wonderful view of its original greenery and tranquil relationship with nature. The blend of original music can be heard throughout the island. The lyrics depict love,celebrations and life purposely written and sung to bring singers and people together in understanding the humors that exist in everyday life. 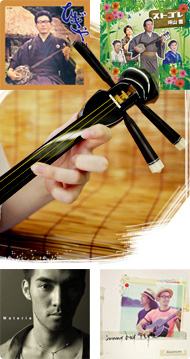 It further brings out the differences between classical music and music made in an islander’s mindset. At the present, there are more than forty bands active in the island of Amami and their new releases continue to amaze visitors to the island. The “luminous turban shell” is native to Amami Island. Green on its outer shell and pearl-like color on the inner side, this large sea shell, has from long ago, been used to fashion outstanding things like letterboxes, music instruments and many others. The luminous turban shell is confined to Amami Island and its immediate areas in the north. Its merisis is very slow but its pearl-like nature more than compensates for that. It is renowned all over the world for its luminous properties. Most guide books will tell you where to go swimming on an island, but there’s much more than that in Amami Island. The Mediterranean atmosphere in Amami is an attraction on its own when you notice there is no calmer sea to compare the coastline with in the world. Besides, the very rare and famed “Amami batik” is hand-woven here. Dying of the batik is achieved by boiling the bark a naturally occurring tree called “TECHI”. Finishing of the batik is achieved by further dying it in a mud mixture very rich in iron. To weave and complete the process for just on batik can take as long as one year. Amami batik is very durable and can be passed down to as many as three generations while its quality remains intact. With a quality comparable to arabesque of the Middle East, Amami batik comes in different natural patterns that never ages. 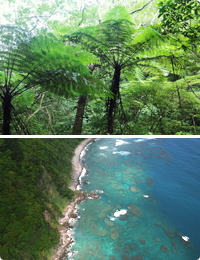 Amami Island boasts three beautiful Seascaps. To the east of the island lies the Pacific Ocean in its grandeur. To the west Is the East China sea with its bottomless Intricacies and to the South, the Inland sea of Tranquility. All there seas in their cobalt blue combine to create and sense of limitless Time and space.